A couple of videos and a little news on apples and flowers! It's grafting season. A lot of people have probably already finished their scion trading, but here is my take on storing and shipping scions. I was so caught up in the details that I kind of forgot the basics, like store them in the refrigerator. If it were more comprehensive, it would also include storing the scions without refrigeration, which maybe I'll do later, but same basic concepts apply. Mostly, I was trying to address the potential of excess water and the use of paper to cause problems. And for those of you who are lucky enough to have black trumpet mushrooms in your neck of the woods, this video is on how I clean them really fast, and dry them. It also includes a (what in my opinion is an all too short) rant on efficiency and work as a symbolic activity. It is a long video for how to do something really fast, but I think the stuff about intention and mental attitude is just as important as the physical part, and it will save your a lot of time in the long run if cleaning large quantities. DOOOOODS!!! 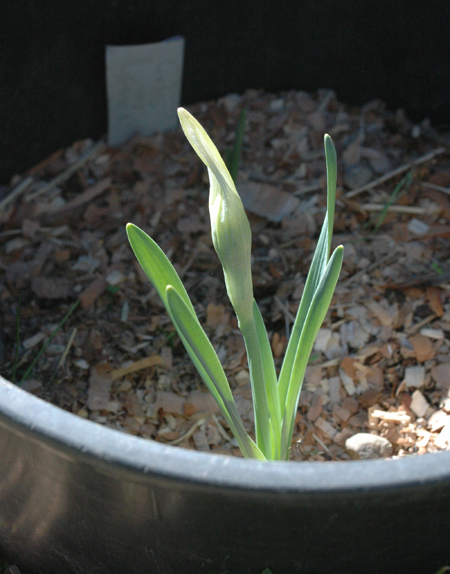 Two flowers from the first batch of Daffodil Seedlings grown from seeds pollinated in 2011 have put forth flower buds! The bulbs arestill rather small, so I wouldn't be surprised if they are under-developed, but that's still pretty exciting, especially considering that I haven't taken stellar care of them. I figured I was at least another year off from seeing anything. I seem to pick breeding projects that take a long time. Daffodils typically take about 4 years or more, and apples 5 or more years. They should open within the week, at which point I may have to update the Daffodil Lust series with a new post. Even more exciting, one of the seedlings is from Young Love, the daffodil that inspired it all! I just recieved 50 apple rootstocks in the mail for grafting up my latest round of red fleshed apple seedlings, and last year's pollinations are sprouting up in the greenhouse. Good news, I just talked to my friend Freddy Menge, who is sort of my apple guru or early inspiration. We talk about apples on the phone about every other year. He's getting results from his apple seedling trials, which I believe are mostly open pollinated, but he has a good collection of quality hand selected varieties growing, not just some random stuff. He say that he gets more apples that are worth eating than ones that aren't. That's just what I suspected when I started my breeding project and what Albert Etter seemed to be saying. It also is totally at odds with what passes for common "knowledge". He has sent me two of his seedlings that I'm trying out, one I've been calling King Wickson (not sure if he has a name for it) which he thinks is a King David x Wickson cross. The other selection is Crabby Lady a small, more intensely flavored version of the latest ripening apple here, Lady Williams, also thought to be crossed with Wickson crab. Crabby Lady ripens at the same time as Lady Williams, and sounds like a real improvement on an already very good and super late apple, so that really got my attention. I'm hoping King Wickson will fruit this year, but I just grafted Crabby Lady this past week. Freddy also said that about 1/4 to 1/3rd of his red fleshed apple seedlings have red flesh. I was hoping for a little higher percentage than that, but such is life. I may do some crosses between red fleshed apples this year to try to reinforce the red fleshed trait. Another amateur plant breeder just contacted me through the blog who is also gearing up to do some red fleshed apple breeding. Yay for grass roots apple breeding for the masses! Posted on February 20, 2015 by Steven Edholm and filed under Apples, Daffodils, Foraging, Garden Stuff, grafting and tagged apple breeding Black Trumpet mushrooms breeding daffodils Daffodils Grafting.